www.ajnoha.com to be started again soon!!!! Please donate towards the development of Ajnoha. payments are secure via pay pal. click on the button to continue. This website is created to make Ajnoha the best village in the area with all modern world facilities. it will be meeting place for all natives of Ajnoha village. Ajnoha is the first village in Punjab to have its own website which was started in 2003.Please contribute towards the development of the village by going through the Projects page and having paid membership. Village AJNOHA is situated in Hoshiarpur district of Punjab (India) at Bist doab canal which starts from ropar and extends up to the fields of jalandhar. Ajnoha is situated at an equal distance of 20-22 kms from Phagwara, Mahilpur, garhshanker and Hoshiarpur. Ajnoha is surrounded by villages Nadalon, Baddon, Panjaur, Mayo Patti, Panshta (Panchhat), Jalwehra, Nangal-Thindal-Chairan and Todarpur. 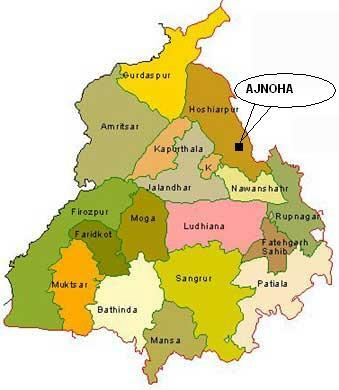 MAP OF PUNJAB SHOWING AJNOHA. Ajnoha is proud to have produced the great panthic leaders. see more in personalities page!! !